Alzheimer’s Society’s Singing for the Brain groups have launched a bid for chart success with an emotional song that aims to highlight what is still possible after being diagnosed with the condition, and to raise funds for research and support. Never Will Forget (John’s Song) was penned by songwriter and radio presenter Ian Calvert. Ian was inspired to write the song and raise funds for charity, having witnessed his father-in-law’s physical and mental health deteriorate due to dementia. In partnership with Peninsula Arts at Plymouth University and Alzheimer’s Society, the song has now been released for download in a bid to heighten awareness of the effects of dementia and raise vital funds to support the charity’s work. And while Ian assumes the role of lead vocalist, his backing singers are made up of people with dementia and their carers, all members of Alzheimer’s Society’s Singing for the Brain groups from Plymouth. 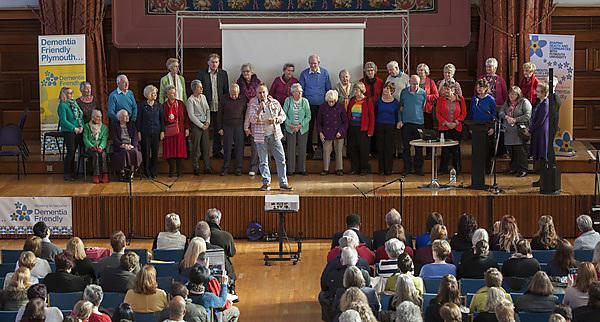 Working in partnership with Plymouth University and Peninsula Arts, the Singing for the Brain groups themselves have demonstrated that being an active part of the community is still very much possible if you receive a diagnosis of dementia. There are currently around 850,000 people living with dementia, costing society over £26 billion per annum, and that number is predicted to reach one million by 2021. Plymouth University is the UK’s first dementia friendly university, and is at the forefront of research into new treatments and support networks having recently been awarded more than £1 million to fund dementia studies. Singing for the Brain is a social activity for people with dementia and their carers enabling them to express themselves and sing with others in a similar situation. Never Will Forget (John’s Song) was arranged for orchestra by Simon Ible, Musical Director of Peninsula Arts at Plymouth University, and recorded in Plymouth by Simon Honywill and Jay Auborn of DBS Music.